The Dáil has been debating a medicinal cannabis bill this evening. 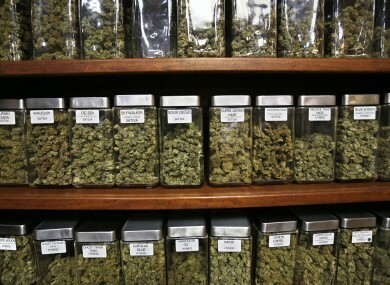 Marijuana would not be on sale in a cannabis dispensary such as this in Colorado. A BILL THAT would regulate cannabis for medical use was passed by the Dáil this evening but doesn’t mean there will be cannabis-based products in pharmacies tomorrow. The Cannabis for Medicinal Use Regulation Bill has several stages of legislative scrutiny to go before this happens. After the bill now passes the second stage, the bill will proceed to the Oireachtas Health Committee where it will be discussed by members. Speaking in the Dáil this evening as he confirmed that the government was not opposing the bill at this stage, Health Minister Simon Harris said he has requested that the Health Products Regulatory Authority (HPRA) provide him with its research on the matter. The HPRA’s report will detail clinical research on the efficacy of medicinal cannabis as well as advising whether any legislative changes would be required. “I have, for the first time in this country, initiated an expert review of medicinal cannabis,” Harris said. The minister added that HPRA’s report is to be completed by the end of January 2017, at which time it can proceed to committee stage. At this stage, elements of the bill can be challenged, teased out and amendments proposed. After that process is completed the bill would have two further stages in the Dáil before it is passed by TDs for the final time. This could take place in the first half of next year. The Dáil also heard that, depending on the view’s of the HPRA, this may not be required to give effect to the bill. Changes to existing legislative controls through a statutory instrument under the Misuse of Drugs Act could be sufficient. That is why, despite having significant objections to elements of the bill, I think it would send the wrong message to the many people who have contacted us all with their personal stories to divide the Dáil on this issue and why I have decided not to oppose the bill at second stage. The minister’s objections to the bill echoed those which he has outlined previously. He said he would be “very concerned” if the inadvertently legalised cannabis for non-medical purpose. Harris also objected to two agencies the bill proposes to establish, labelling them as “new quangos”. Despite this the minister said that such concerns could be addressed at committee stage. Fianna Fáil is also supporting the bill with TDs Billy Kelleher and James Browne speaking in its favour. “I don’t believe it should be treated any differently to any other regulated medical product,” Kelleher said. “We wouldn’t dream of denying access to morphine,” Browne added later. Independent Clare TD Michael Harty spoke against the bill, however. He said that while he supports the use of cannabis based oils to alleviate pain, the bill in question goes too far. “The bill is so flawed it should not be given a second reading,” he added. A number of TDs requested that Harty allow the bill to proceed so these issues can be address later. When the members concluded their contributions, Leas Ceann Comhairle Pat ‘The Cope’ Gallagher allowed the bill to pass without a formal vote after only one TD spoke in opposed to it. The bill was proposed by TDs Gino Kenny and Richard Boyd Barrett of AAA-PBP and was also supported by Sinn Féin, the Green Party and the Social Democrats. Speaking at the conclusion of the debate, Kenny said that the issue has become an emotional one for him. “It’s been quite an emotional week for me. It’s been hard but not as hard as some people’s circumstances. I mean I see people here who I’ve got to know over the past number of months, people I consider my friends,” he said. “I’m new to this game, the last thing I would want to do is set up a new quango,” he added in response to the minister’s criticism of the bill. a very, very healthy day for democracy of Ireland that we can agree on something very, very valuable to a lot of valuable people. Email “Cannabis-based products won't be in pharmacies tomorrow, but we have a timeline ”. Feedback on “Cannabis-based products won't be in pharmacies tomorrow, but we have a timeline ”.